The handcrafted beers –also available in growlers – are moderately priced and offer unique styles and flavors not typically produced by major breweries. The patented brewing process, known as Fermentus InterruptusTM, makes replicating the same great taste simple and efficient throughout all Granite City Food and Brewery restaurants. The modern-designed space at National Harbor, which includes a comfortable dining room, three-sided modern, full-service bar, two private dining areas, an open kitchen and on-site brewery, creates an inviting ambiance with its dark wood and granite accents. For added convenience, the restaurant features family-friendly restrooms, purse hooks, and USB and electrical outlets underneath the bar for tech-savvy guests in need of a charge. 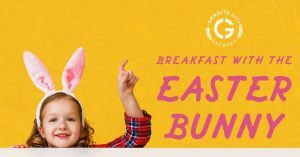 Join us April 13th from 9:00 AM- 12:00 PM for breakfast with the easter bunny. We will be serving a breakfast buffet with fruit, croissants, scones, reggiano hash browns, bacon, sausage, RumChata french toast, and our Donut creation station featured in our Lawless Brunch! Prices for $12.99 and $5.99 for kids , 5 and under are free. The Easter Bunny will be making table side visits and posing for pictures!